As a parts guy, I use pens for a good portion of the day, so it makes sense for me to include my pens in my EDC. Due to the nature of my job, my pens tend to walk away, so I really try not to use my expensive pens, though today, I've got them here with me to show what I like to carry. From the top, there's the Zebra G-301 Gel Retractable Ballpoint pen. The retractable ballpoint pen is perhaps one of the most common pen types, as well as the most versatile. The G-301 is a Gell-ink version of Zebras more popular F-301. Next, we have the Zebra Stylus retractable ballpoint. I like this one because it has a stylus for use with touchscreen devices on the top. It uses the Zebra C15 refill. Next is the Zebra F-701, which is functionally identical to the F-301, but with a Stainless Steel body. It uses the 301a refill. The Zebra F-402 is, again, another variant of the F-301, just with a more ergonomic body. I would say this is my favorite pen I own. This Pilot Precise V5 RT, while an inexpensive pen, writes vary nicely, with a fine .5mm line. This is a retractable rollerball pen. The Sharpie Pen Stainless felt-tip fine-tip marker is nice for marking shelf tags, warranty cards and other things that require a permenant, fine-line marking. 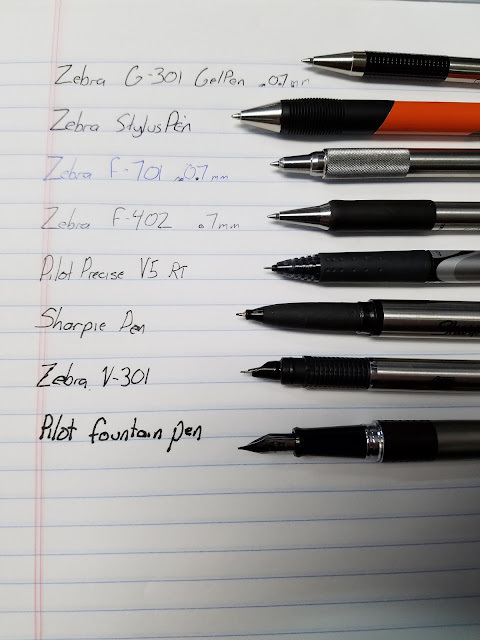 The Zebra V-301 Fountain Pen, while not a normal fountain pen, writes smoothly, and doesn't make a mess like other fountain pens. It's a bit awkward for leftys, though, ans I found out. Finally, the Pilot MR Animal series fountain pen lays down thick lines or thin, depending on how you hold the pen. It does make a bit of a mess, though, And it goes through ink faster than any pen I've ever had. But, it does write nicely. Keep checking back for more EDC stuff. Wow, These are all amazing collection of the luxury pen. I am going to get one of these for my daughter. Hope so she likes it. If you are looking for more luxury pen, then you can visit here.